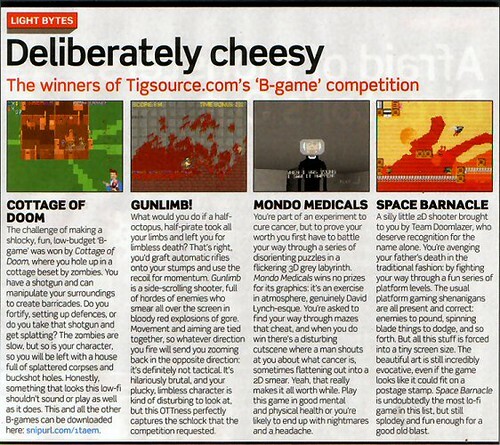 Looks like PC Gamer have given TIGSource’s B-Games contest a mention in the latest issue, along with Petri’s Gamma256 exhibit Bloody Zombies. 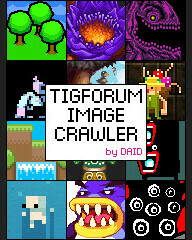 On top of that, a couple of games from the contest (Toadzilla, Cottage of Doom, Save the President and Space Barnacle) were featured on the coverdisk! Well done, lads! Haowan has scans of the relevant pages in this forum thread. Man, after the traffic that this site got with the Best Games of 2007 list, what’ll this do? I love PC Gamer UK. They cover way more indie games than their US cousins, and the fellows who work for the magazine are both handsome and brave! Gogo TIGS! Well done guys!